in Carbon and Our Soil, Education, News At A Glance and tagged carbon farming, carbon storage. Bookmark the permalink. Agriculture is vital to the state of Missouri. In 2016, Missouri agriculture, forestry and related industries put nearly 400,000 people to work and contributed more than $88 billion to the economy. But this critical sector is under threat, in part due to the increase in extreme weather events powered by a warming planet. 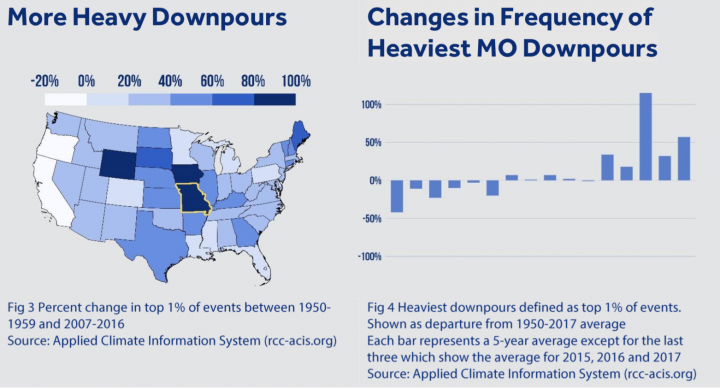 Data from the state climatologist show that since the 1950s, there’s been an upward trend in the number of downpours when there is at least three inches of rain in one storm. In our new report, Soil Solutions: Climate-Smart Farming in the Show Me State, we analyze the extent to which use of conservation farming practices — ones that are well known, but not always widely applied — can reduce carbon pollution and yield carbon savings in Missouri. We examine the potential benefits of various individual conservation farming practices for Missouri’s nearly 10 million harvested acres of field crops, and we also look at total potential savings county-by-county if practices were to be adopted statewide. For ranchers, the greatest carbon sequestration potential comes from modified grazing practices, like rotational grazing. 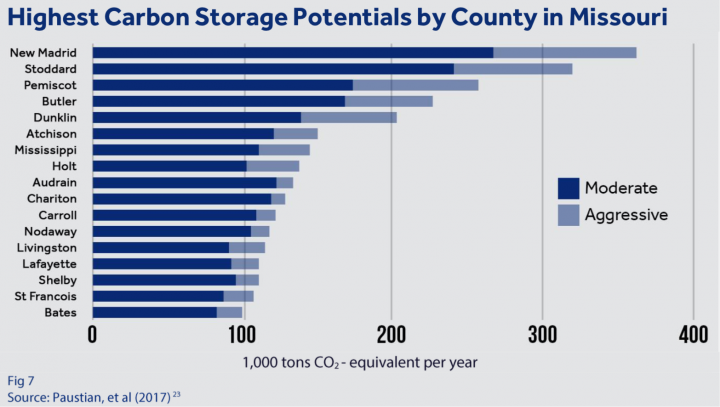 The estimated total annual carbon storage potential for the state as a whole, with the aggressive adoption of conservation practices, is equivalent to more than twice the annual total greenhouse gas emissions of Columbia, home to the state’s flagship land-grant university. 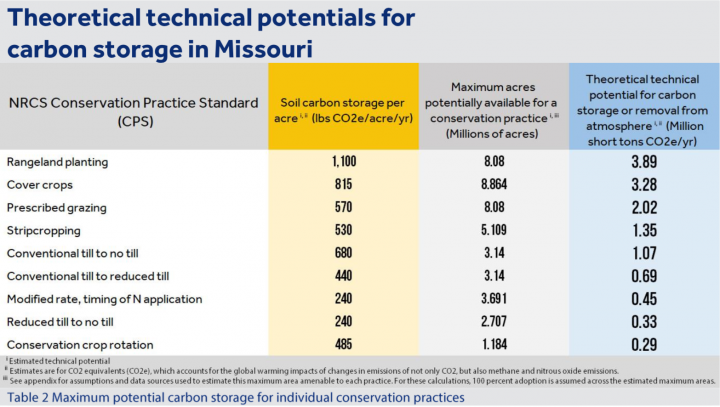 At the county level, New Madrid shows the highest potential for carbon savings. The county is in the southeast “Bootheel” region. Five counties with the highest-potential carbon savings are in or adjacent to the Bootheel. Some farmers and ranchers in Missouri already are putting conservation farming into practice and offsetting emissions. Although agriculture is the fifth largest source of greenhouse gas emissions in the United States, according to the EPA, opportunities exist for the sector to take carbon out of the atmosphere and sequester it in the soil. Missourians are demonstrating that conservations practices are providing a win-win-win outcome — improving soil health, financial health, and the overall health of the planet. The full report, SOIL SOLUTIONS: Carbon-Smart Farming in the Show Me State, can be read and downloaded here.